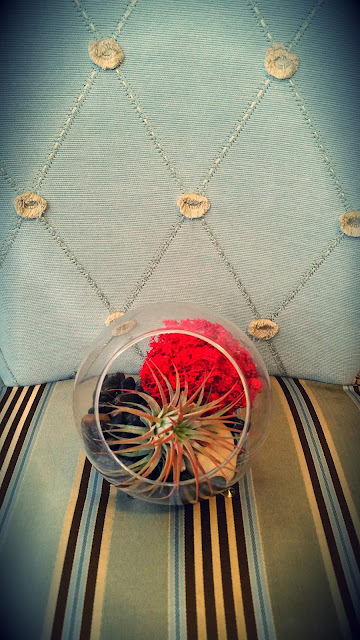 A few months ago, I received a beautiful air plant in a round glass terrarium as a gift. I had never seen anything like it before and I had no idea how to care for it. If you're anything like me, that's precisely why you're here today! Well, after doing tons of research, talking to a few knowledgeable plant keepers, and caring for my own air plant for several months, I decided to write up a quick little care guide for other new air plant owners. 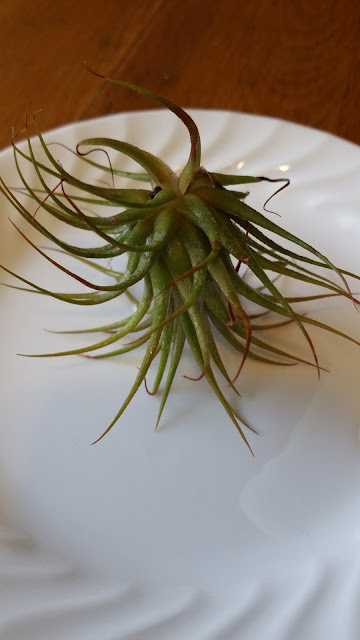 First off, I should tell you that the proper name for an air plant is Tillandsia. Pretty name, isn't it? Tillandsia plants are native to warm climates. They prefer filtered sunlight. I keep mine near an East-facing window. The temperature in my house fluctuates based on the time of year, but it never dips below 16 degrees Celsius. I wouldn't recommend keeping your air plant in an area that gets colder than 12 degrees Celsius. Now, we all know that plants usually drink water through their roots, well air plants do not have roots! So, they have to absorb water through their leaves! You will have to water your air plant in two ways, by misting and also by soaking. 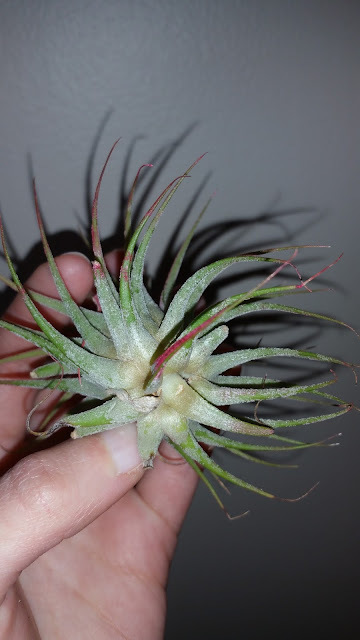 The bottom of the air plant. Notice the lack of a root system. Misting: I have a little spray bottle. 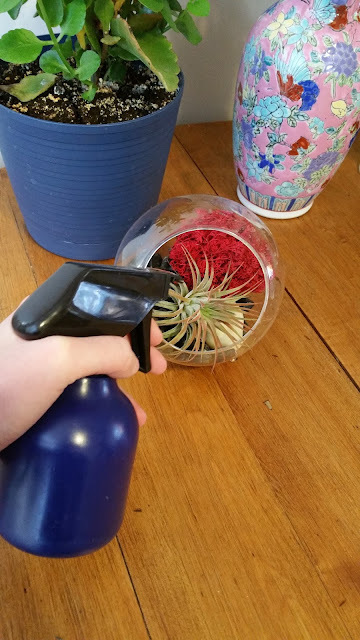 Every second day I gently and sparingly spritz the plant. Just a could spritzes seems to be adequate. Just a couple of spritzes is all it takes! 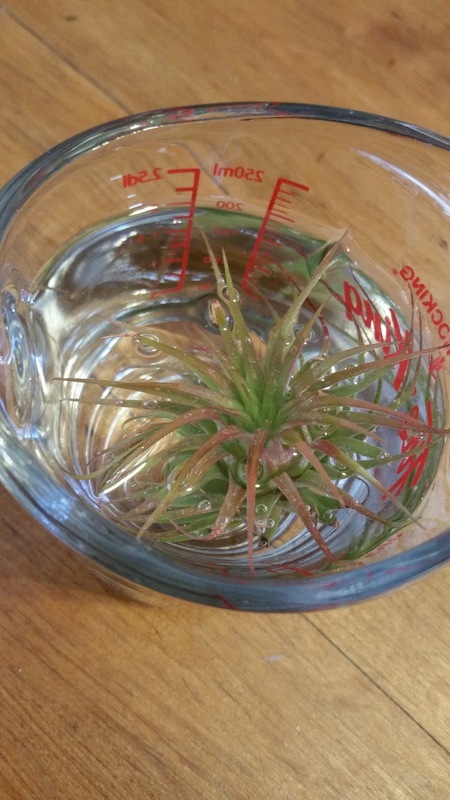 Soaking: Every couple of weeks, your air plant will need an extra drink. This part is kind of fun and unique. Fill a glass measuring cup with non-chlorinated water. Gently pick up your air plant out of the terrarium and submerge it into the water. Allow the plant to soak for 1-2 hours. Time for a nice, hydrating soak! When the time is up, remove the plant from the water and gently shake off the excess water and allow it to dry out on a clean plate for an hour or so before returning it to its terrarium. And that's pretty much all there is to it. Pretty simple huh? In the past, these types of "designer" houseplants have typically scared me away because they are usually quite finicky and hard to keep, but that's certainly not the case for Tillandsia. Have you jumped in on the air plant craze? Or are you still on the fence as to whether this is the type of plant for you? Let me know in the comments section below, I would love to hear from you. For instant access to more great posts like this, exclusive content and contests, 'Like' Keen Koala on Facebook by clicking HERE!